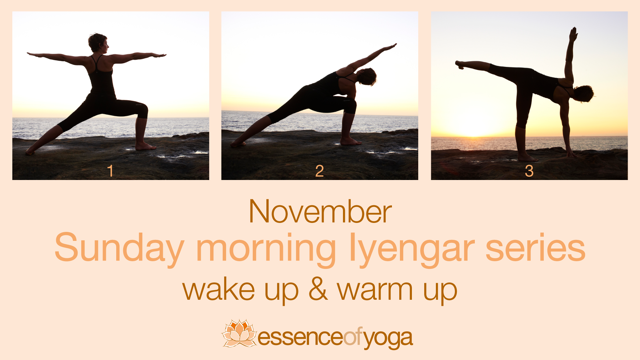 A series of three Sunday morning classes to energise and revitalise. For all new yoga students, those new to the Iyengar style of yoga and existing students wishing to consolidate their understanding. Poses are methodically taught and time is taken to ensure that each student develops an understanding of the poses. This Sunday morning series will incorporate a standing sequence to build strength, stamina and flexibility, a seated section and conclude with restorative asanas to calm the body and mind. You will leave feeling refreshed, lighter and focused. A wonderful way to wake up and warm up on Sunday mornings. £12 for a single session / bring a friend £10 each or £30 for the complete 3 series.